(UPDATE ADDED 12-1-05) I must apologize profusely to Rokh who writes the great blog Tham Jiak because when blogger mangled this post I did make a BIG error, I left out her great herb post on curry leaves. It was in the original but fell victim to the mangling and I missed it. I’m so sorry, and it’s ironic because I was so excited to get an entry about curry leaves. I had always been curious about them. Rokh used her curry leaves to make Vadai, a type of fried gram snack food that is eaten in Malaysia. First, let me say that when I heard that CookieCrumb and Cranky were going to be under *house arrest* at her parents’ house, I was not surprised when I did not hear from her. However, I did managed to spot Bean Sprout snuggling up to a rosemary bush down there in Southern California where CC’s folks live, so I decided Bean Sprout didn’t want to be left out. The first blogger to send me a link this week was Eggy, all the way from Singapore, a first for WHB. Eggy writes a fun new blog called Greedy Goose, and she posted about growing herbs from seed and her version of Laksa, something I’ve always wanted to try. Eggy is obviously a talented woman, and I hope we will hear more from her. Next was The Cooking Adventures of Chef Paz, sharing a zucchini recipe from Lidia, someone I love to watch on the Food Network. Paz had wanted to make something with zucchini blossoms, but in New York City in November, they proved hard to find . We will look forward to hearing about that cooking adventure next summer. Another interesting post from Vijay flew into my inbox next. My Dhaba is a great blog which shares all kinds of interesting information about Indian culture and cuisine, and this week we learned about the Ayurvedic medicinal uses of the radish plant. Vijay also shared two very interesting recipes for salads using radishes in ways that were new to me. Squeezeweasel from Gastronomy Domine is off to Prague next weekend, but this weekend she managed to get out and photograph some wild violets in bloom (in England in November!) and also the seedhead of a wild carrot. SW promises that if her hotel in Prague has internet connection she will send us something interesting from there for next week. From Melbourne, Ed Charles of Tomato sent a great photo of poppies in a herb patch. Ed is going to try saving he seeds or possibly making tea from them. Meanwhile, in the “grass is always greener on the other side of the fence department,” I wish it was summer here and Ed wishes he was in Utah skiing. From Tuscany, Ilva of Lucullian Delights sent a great photo and recipe for Tuscan Kale. If you know that this vegetable’s name in Italian translates to black cabbage, it will help you figure out the recipe’s name Calovo Nero Con Pepperoncino. Tuscan Kale is also often used in Ribollito, a famous Italian soup. Farmgirl Fare from Missouri shared some tips for growing mint, information about the properties of mint, and some very nice comments about Weekend Herb Blogging. She also sent a fun Herb/Dog Blogging photo showing her dog getting into the garlic. 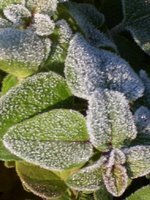 I know you have probably already seen my herbs covered with frost, but here’s a reminder. I also shared some recipes of how I used those herbs earlier this year when the weather was more cooperative. Now I am off to cook something out of my new favorite cookbook, Mark Bittman’s The Best Recipes in the World. In fact, I like this cookbook so much I am thinking of doing a regular feature on Kalyn’s Kitchen sharing my interpretations and photos of recipes I find in the book. Now, go off and cook something yourself, that is after you take a look at all these incredible herb posts. Rokh, I am so embarassed and your post was so great too! I will fix it right now! Profuse apologies are coming to your in box. Thanks for the kind words Kalyn! Whoo– frost on the herbs; poor you. Bundle up! That was yet another great edition Kalyn. We at my dhaba have enjoyed reading it thoroughly. Appreciate your hard work involved in the whole round-up process. Kudos once again my friend. Cheers!